Who is the accomplished lady? Jane Austen tells us who deserves the respect and praise of being educated, refined and accomplished. of quick, hurry and rush as it is now. People took their time. Women became ladies. lived their lives in those times, according to the writings of Jane Austen. 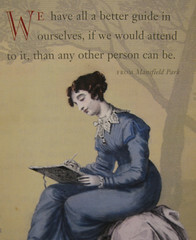 Reading deeper into the writings of Jane Austen, one can discover how society viewed the quality and class of ladies. Similar to today, men of status wanted to marry women of the highest quality. She is described in many words today, ‘educated’, ‘beautiful’, ‘family oriented’, ‘intelligent’, ‘kind’, ‘elegant’ etc. but we can sum it up by saying that she is an accomplished lady. Like in Jane Austen’s times, an accomplished lady commands the respect of society and everyone around her. She will probably have a score of very eligible suitors. What are the Traits of an Accomplished Lady? The words in italics are quoted from the book. My Darcy, his friend far from agreed with him. He goes on to state that he does not know more than six women whom he can consider to be an accomplished lady. And Mr Bingley’s sister heartily agreed with him. Bingley’s sister, who probably had her eye on Mr Darcy eagerly agreed as she was trying to impress him. She is described as “his faithful assistant” (with sarcasm from Jane Austen I’m sure) below. Thus, we can draw these conclusions from Mr Darcy, and representative at that time of the description of the ideal woman. She must yet add something more substantial, in the improvement of her mind by extensive reading. These are what respectable men in that day wanted as wives. They certainly did not want silly wives. How Does That Apply in Today’s Society? What really left me astounded was how little that has changed from 200 years ago. The descriptions are how one today defines as traits of class. The more traits you have, the ‘classier’ the world views you as. If a woman or a young girl in her education pursued the above list, then we can call her what we call today as being ‘classically educated‘. She will have her character shaped through the the discipline of her mind through hard work, acquisition of knowledge and the esteem of the arts and language. Her confidence will soar with her education, allowing her to develop poise, manners and the ability to socialize elegantly. Just food for thought. What do you think? Thank you for reading ‘Accomplished Lady’!